Two cell phone waiting areas are available to make it convenient for those picking up arriving passengers. When your passengers have retrieved their luggage, exited the baggage claim area, and are waiting at the curb they can call you on your cell phone and you may proceed directly to curbside pickup. This will keep you from having to drive around and around the terminal while waiting for them. Drivers, who are picking up arriving passengers, may choose to stand by in the current Cell Phone Waiting area located on Aolele Street, near the intersection with Lagoon Drive. Exit freeway or Nimitz Highway to Lagoon Drive, Turn Right at Lagoon Drive onto Aolele Street. Or, Exit freeway to airport and turn right onto Aolele Street at the Paiea Street/Aolele Street intersection. Exit freeway to airport and remain in left lane to Paiea Street and head east towards Lagoon Drive. 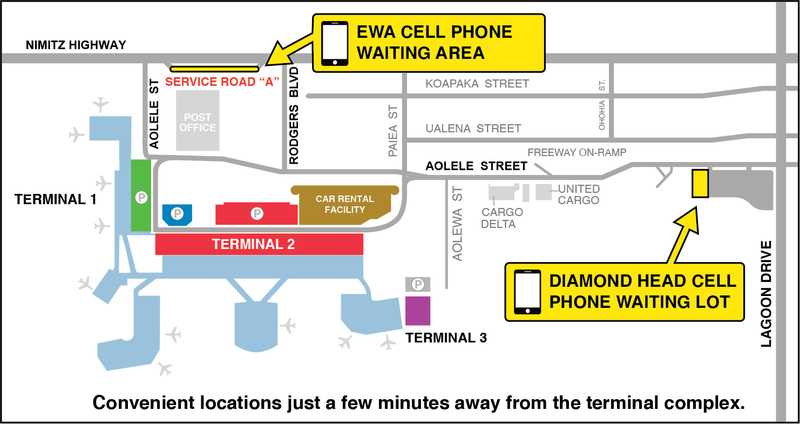 The Ewa Cell Phone Waiting Area is located on Service Road A near the Airport Post Office (intersection of Nimitz Highway and Aolele Street) and just a few minutes away from the airport terminal.